The OmniPro II is HAI’s flagship automation and security controller. It is designed for large residences and commercial installations. The system provides enhanced comfort, safety, convenience and energy savings by coordinating lighting, heating and air, security, scenes and messaging based on activity and schedules. This model comes with a OmniPro II controller with enclosure, lock set with two keys, PIM, RJ31X cord and jack, and manuals. OmniPro II features the most powerful version of HAI’s Advanced Control Programming (ACP) logic that allows installers and owners to set schedules and actions performed by the system. OmniPro II comes with several standard modes, such as Day, Night, Away and Vacation, and can accept customized scenes such as "Good night", "Good morning" or "Entertainment" that set temperatures, lights and security to the desired levels with one touch. Security and temperature sensors can be used to adjust lights, appliances and thermostats, monitor activity and track events. The premises can be controlled and programmed on-site or from a remote location. Easy to read LCD consoles show status and allow control and scheduling of lighting, security, temperatures and accessories. OmniPro II is HAI’s most connectable system. 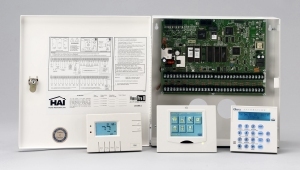 In addition to connections for security devices, thermostats, light switches, telephone and backup battery, the OmniPro II features three built-in serial ports for connection to additional control devices, like HAI’s Web-Link II and PC Access, and Connectivity Partner touchscreens, infra-red controls for entertainment, lighting controllers and computers. With optional Web-Link II, the OmniPro II’s control and monitoring features are available to any device on the home or business data network with a standard web browser, such as computers, PDAs, web-enabled TV’s and web-tablets. OmniPro II also features telephone accessibility, a built-in digital communicator for use with a central station and can dial up to 8 additional phone numbers chosen by the owner for voice notification. OmniPro II has an expanded vocabulary for voice notifications and announcements. A built-in high speed modem allows programming and control from a remote location using HAI’s PC Access program. An ideal choice for large homes, businesses and commercial facilities, OmniPro II is HAI’s 6th generation controller. It has passed the most rigorous product testing for reliability and resistance to surges and interference of any HAI product manufactured to date. It supports numerous Omni family accessories, including a complete line of fully communicating thermostats. 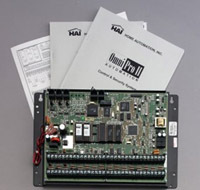 OmniPro II is the most powerful controller ever from HAI - the company that’s been leading the industry since 1985. The OmniPro II Controller for Structured Wiring Enclosures (HAI Part Number 20A00-8) fits in Leviton, OnQ, UStec, Siemon, and “open house” type Structured Wiring Enclosures. This model comes with an OmniPro II controller on mounting plate, PIM, RJ31X cord and jack, manuals, accessory kit, and a wiring diagram for the enclosure door. The OmniPro II Commercial Controller (HAI Part Number 20A00-5) comes with an OmniPro II controller with commercial attack proof enclosure, lock set with two keys, PIM, RJ31X cord and jack, and manuals. The OmniPro II Board Only may be purchased with HAI Part Number 20A00-21. Lights, control outputs, temperatures and security modes can be scheduled by time, sunrise, sunset, and date or day of week, as well as various system events. User codes can be made valid during certain times and days only, for maid, service, etc. Text and voice descriptions for all zones, units, codes, macros, temperatures, messages, areas. Three built-in serial ports support Omni-Link and Pro-Link, with jumper selectable RS-232 or RS-485. Can be used for programming, monitoring, connection to HAI Web-Link II, personal computers, Connectivity Partner options such as touchscreens, voice recognition, infra-red controls.